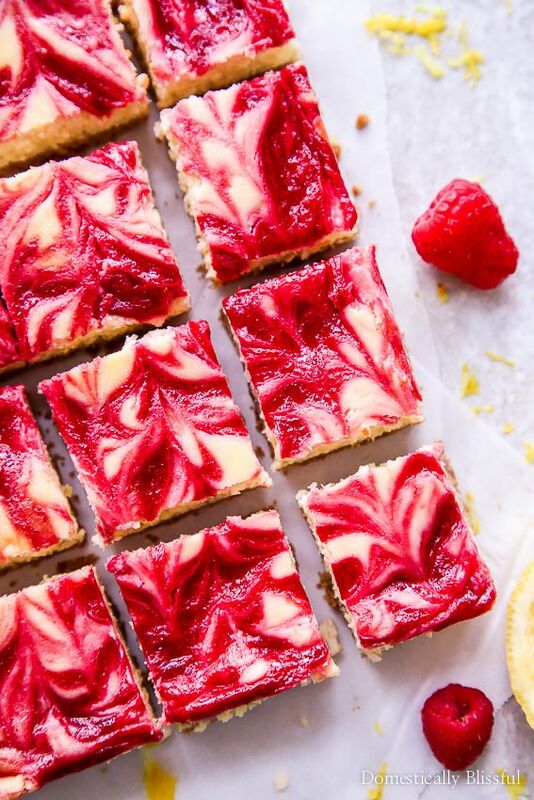 These refreshing Lemon Raspberry Cheesecake Bars are filled with vibrant flavors making it the perfect dessert for a summer party or family gathering. I made it two whole weeks before posting another dessert recipe! I feel super proud of myself! 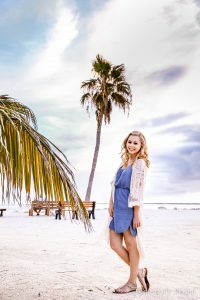 I promise to share more savory recipes as the summer goes by, but what can I say, I can’t deny my sweet tooth! 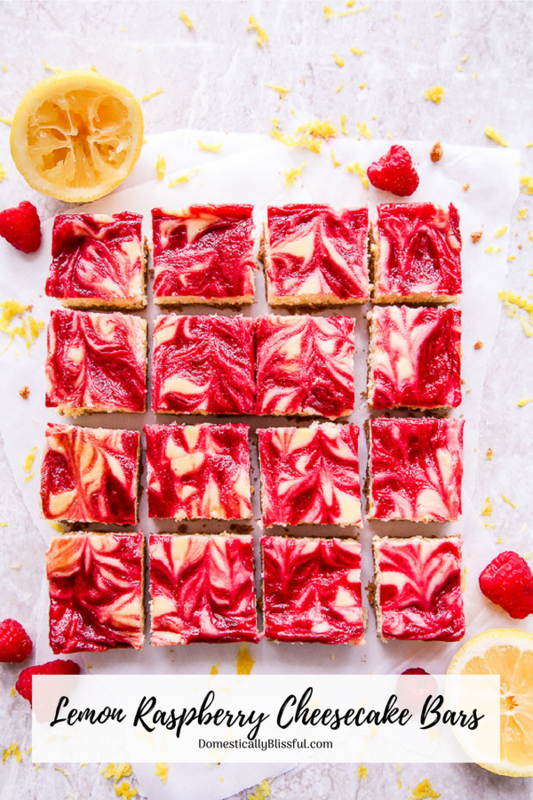 But don’t worry this Lemon Raspberry Cheesecake Bars isn’t too sweet! And it’s the perfect dessert for lemon lovers because it is literally bursting with bright lemon flavor! 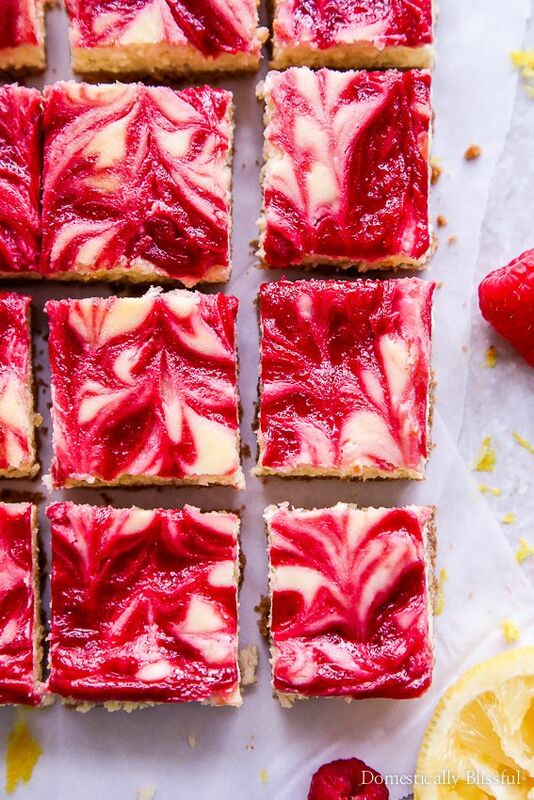 These Lemon Raspberry Cheesecake Bars taste just like summer. Biting into one is like taking a long sip of cold lemonade on a hot day. Very refreshing, but in a light dessert kind of way. 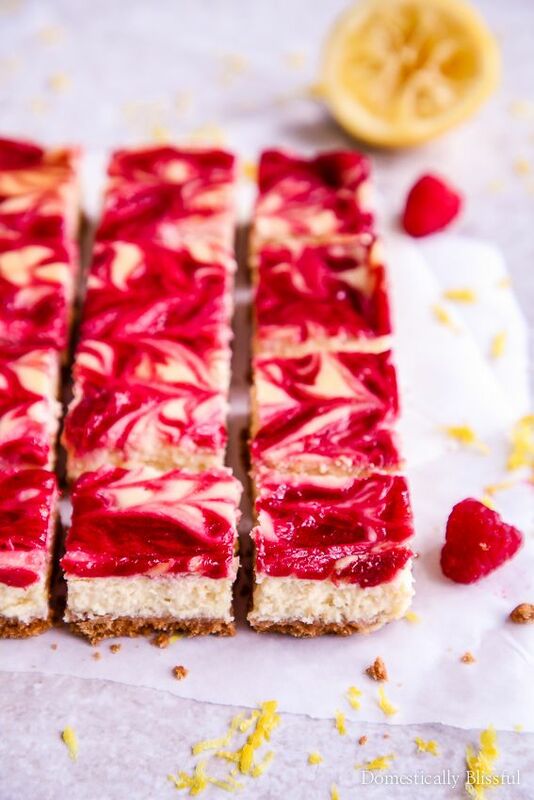 Creamy cheesecake, not too sweet, lots of lemony flavors, & topped with fresh raspberries is just the way I like it. And I’m hoping you will too! 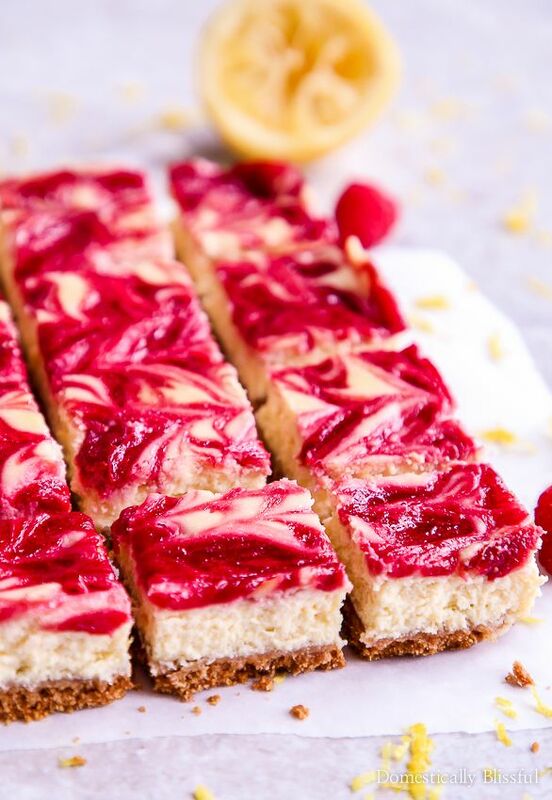 I recently promised Roger’s staff that I would make them a treat so I was able to accomplish three things with these Lemon Raspberry Cheesecake Bars! Share a new recipe with you. Treat Roger’s office to a fun summer dessert. 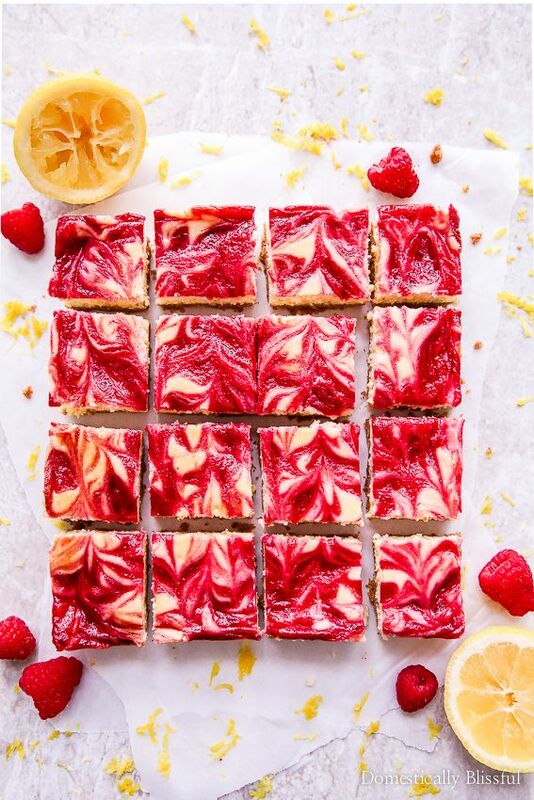 Indulge in my love for sweet recipes & fresh fruit. Now that I’ve accomplished this I can try my hardest to focus on more savory recipes. And I promise to try to make it more of a 1:1 ratio of sweet to savory recipes, but it’s going to be hard. Because let’s face it, as much as we all claim we want more savory recipes, what we really want is all the sweets! And when fresh fruit is involved we can’t help but feel a little less guilty, if not even a little healthy (even when it’s not), because fresh fruit is good for you, right? I’ve noticed that even though more people voted for savory recipes in January when I did a poll on Instagram, my sweet recipes have definitely been the most popular this year. But don’t worry, if you voted for savory & veggies, but have been all about the sweets & fruits, I promise not to tell! Crumble the graham crackers in a food processor & process until all the crackers turn into fine crumbs. Place the graham cracker crumb into a small bowl & mix in the melted butter. Scoop the graham cracker butter crumb into the base of your baking dish & firmly press down to create an even layer. Bake for 10 minutes then remove from the oven & let cool. Keep your oven heated at 325 degrees Fahrenheit. Next, use an electric blender at medium to high speed to blend the cream cheese until light & creamy. Then blend in the 2/3 cup of sugar, 2 teaspoons vanilla extract, 1 tablespoon lemon zest, & 1/4 cup of lemon juice until completely combined. Then add one egg at a time until combined mixing at low speed. Pour the lemon cheesecake mixture on top of the graham cracker crust. In a food processor blend the 6 ounces of raspberries & then strain the pureed raspberries to remove any seeds. Mix in 1 tablespoon of sugar to the raspberry puree if desired. 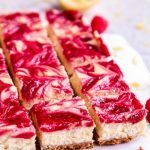 Finally, drizzle & swirl the raspberry mixture with a toothpick on top of the cheesecake. 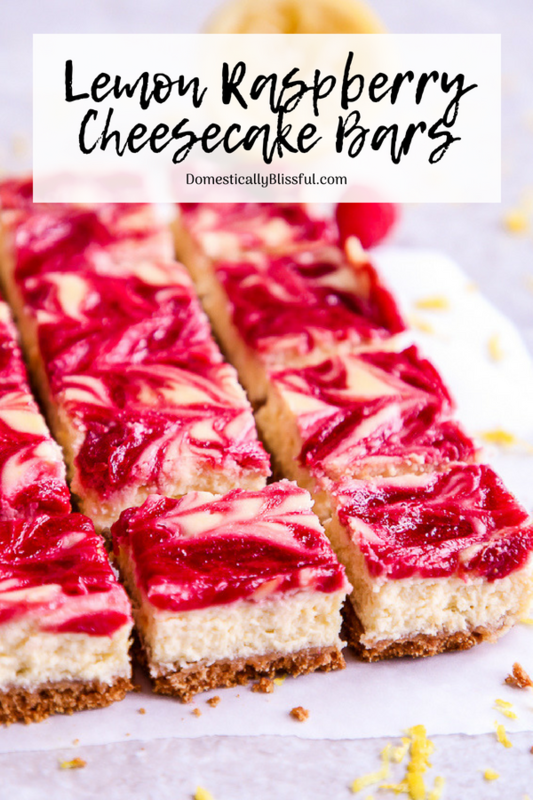 Bake for 35-40 minutes or until the cheesecake is set. Let cool completely on an iron rack in the pan & then refrigerate for 3 hours or overnight. *1. If you prefer a more subtle lemon flavor you can cut the lemon juice back to 2-3 tablespoons (1/4 cup is 4 tablespoons). *2. For easy remove let some of the parchment paper hang over the side. *3. Keep leftovers in lightly sealed container in the fridge for 2-3 days. 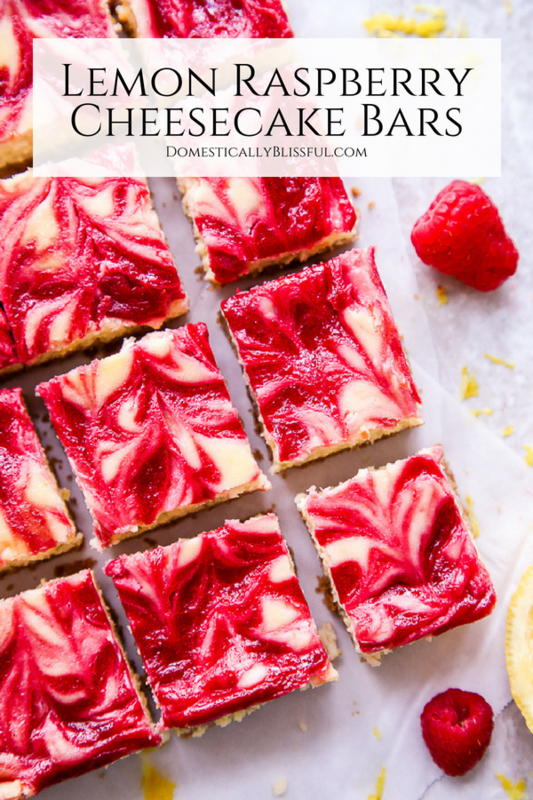 What fun gathering do you plan to bake these Lemon Raspberry Cheesecake Bars for this summer?